Adams Media Corporation, 9781440574337, 239pp. 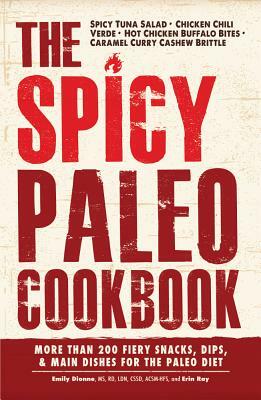 Complete with easy, step-by-step instructions and plenty of preparation tips, The Spicy Paleo Cookbook has everything you need to create delicious, fiery recipes in no time. Emily Dionne is a registered dietitian specializing in the fields of wellness, weight management, sports nutrition, and the paleolithic lifestyle.Erin Ray began the paleo lifestyle in 2012 and now spends her evenings in the kitchen experimenting with homegrown vegetables and herbs, aspiring to master culinary greatness through clean eating.